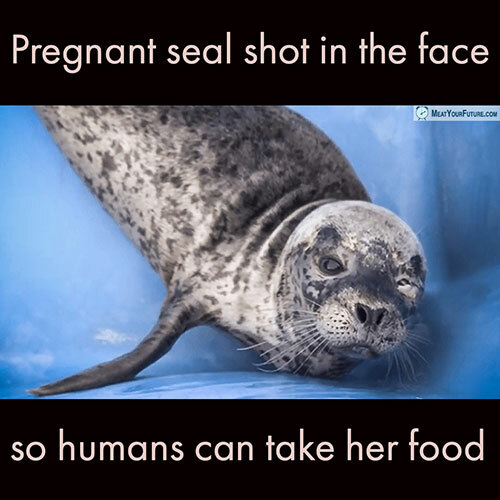 This pregnant seal was found “emaciated and lethargic” after being shot 23 times in the face with birdshot pellets. She literally had 23 pellets embedded in her head. She is now recovering at a Rescue Center in Vancouver, although she apparently lost some of her vision and may not be able to be released back into the wild. Injuring or killing seals has become more and more common as the fishing industry promotes “culling” them because they are seen as “competing” for the fish the industry wants to catch for human consumption. Nearly 90% of fish stocks are fully fished or overfished (per UN FAO), and it’s projected that we will have virtually fishless oceans by 2048 (per Dalhousie University). Killing and blinding seals is not going to solve our “overfishing” problem. Going vegan will. With the human population increasing by over a million every single week, it is simply not environmentally sensible or sustainable for everyone to continue consuming animal foods (including fish). Luckily, we have literally zero biologically need to eat any fish (or other animal foods) for our health. With fish in particular, the pervasive mercury and plastic contamination in “seafood” is a serious health concern that you can easily avoid by simply not eating it. Please do not consume fish, or any other animal foods. Please realize the blatant cruelty and severe unsustainability involved in feeding a human population of 7.6 billion people (and growing) with animal foods (including fish). And, if you’re not already, please go vegan.